He loves to play with Vivi. We love seeing him come out of his shel. 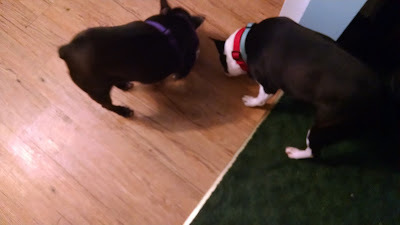 We just wrapped up the NEBTR May Auction that was generously hosted by "For The Love Of Bostons Auction Group" on FB. They helped us raise over $5,000. Before the auction was over, they requested between 30 and 40 photos of NEBTR fosters. Not knowing why, I sent them the photos that I had on my computer. From those photos they have created this moving video. We are scheduled to be on their 2017 auction calendar. They are a blessing to our rescue. Please enjoy this video they created in NEBTR's honor. Finn is doing great. Everyday he does a little better. In many ways he is like a very very high energy little boy. Brought fosters Rascal & Ruby and NEBTR alum Bentley to the Dining Dog today! They were all tickled pink for the car ride and all the treats at the doggie store! 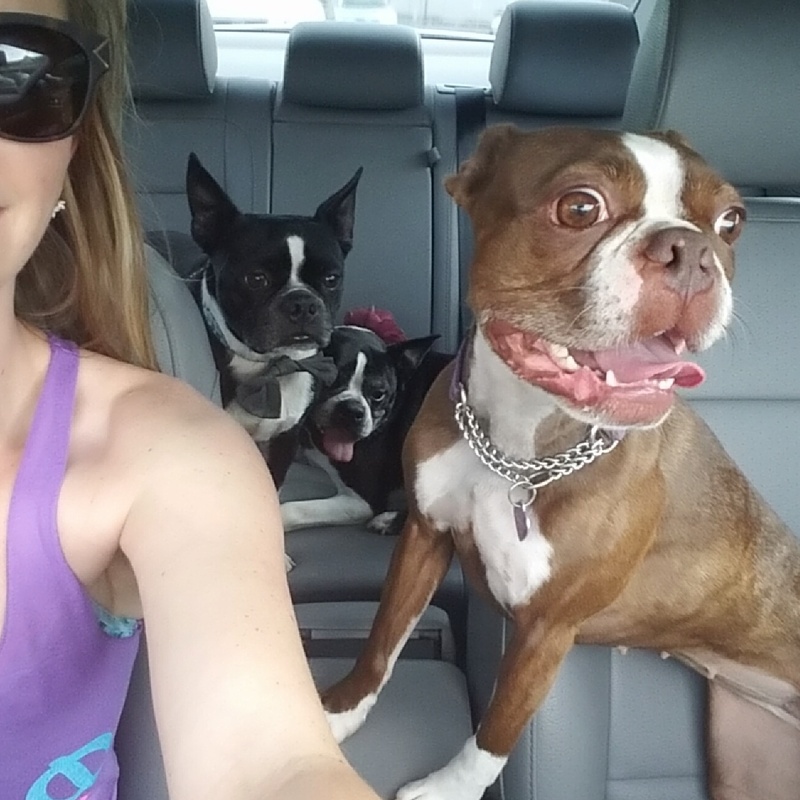 Bringing all 3 Bostons to a pet store doesn't make me crazy right? Love being a Boston Mamma to our beautiful NEBTR Olive!! 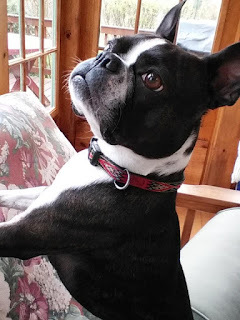 Sign in to iGive.com and indicate that you want to support Northeast Boston Terrier Rescue. As you shop going forward, NEBTR will get money from this. You don't do anything differently than you usually do. IGive will do the rest. I have contributed $252.01 by doing this. Imagine if all of our supporters do the same! So make sure you head over and sign up! Kirby's fosters here and we just wanted to give you all a little update on how he's doing. After a food change due to a chicken allergy (amongst other things), and a trip to the vet for his allergies, he is starting to feel so much better!! Hi Everyone, Here is a video of Maggie getting a good back rub in after coming in from playing outside. Hope everyone is having a great day! Not a great picture but shows that progress can be made even if it takes time. Beanie has been with us just over four years. He came to us dog, food, and toy aggressive. He is fine with our pack except when it comes to food. We have been working with him and now I can share this. I dropped a whole dish of dog food and my chow hounds came to clean up. Normally, Beanie(in purple) would be attacking Chelsie so he could get all the food. Pleasant surprise to see lessons have finally sunk in for my hard headed boy. Love my Beanie.